Aboriginal leaders and their supporters joined together last month for a country -wide demonstration protesting native rights abuse by the federal government. Dene elder Caroline Bjorklund at the Idle no more rally in Churchill. Katie DeMeulles photo. The Idle No More movement has gained momentum in First Nations across Canada. In part, it’s a response to the federal government’s omnibus budget Bill C-45, which, among other things, removes environmental protections of numerous waterways and makes it easier to sell reserve lands to private corporations. The movement also supports and has gained momentum from Attawapiskat Chief Theresa Spence ,who has been on a hunger strike for 25 days now , to force a meeting with Prime minister Stephen Harper over housing, education and other issues in Attawapiskat. 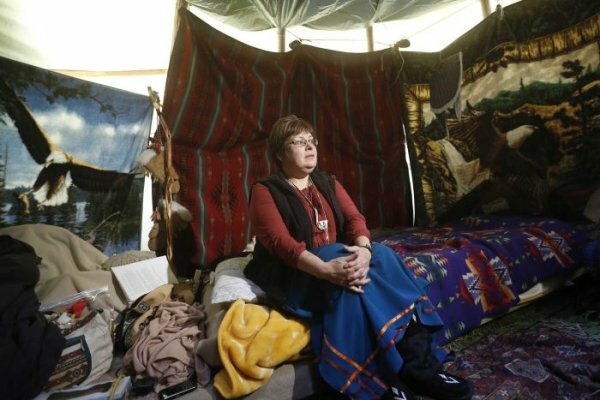 Attawapiskat Chief Theresa Spence on hunger strike in her tipi. Source ABC news. Protesters in Churchill town square support Idle No More cause. Katie Demeulles photo. Spence launched her hunger strike on Dec. 11, days after the House of Commons passed the Conservative government’s omnibus budget legislation, Bill C-45, which organizers with Idle No More say violate treaty rights and weaken environmental laws. Protests have been held in many Canadian communities, including Churchill, and outside the country since the movement began late last year, as a campaign by four women from Saskatchewan to oppose a number of bills before Parliament, including the omnibus budget legislation. Idle No More has gained increased momentum, particularly with a new generation of young, social-media-savvy activists. Thousands have used the #idlenomore hashtag on Twitter to debate issues and spread information about upcoming protests.